For years, Sonos speakers and software have been our de facto choice for a wireless multiroom music system. In the face of increasing competition from the likes of Denon, Polk, Samsung, Yamaha, and others, the company’s releasing an overhauled flagship Play:5 speaker and some smart software that makes your Sonos speakers sound good no matter where you place them in a room. You see, we’ve always loved Sonos because it just works. Once you set it up, and the company’s constantly been working on simplifying the setup headache, the system is super easy to use. It’s always connected to your home’s wifi network, and as you move in and out of wanting to listen to music, and in and out of different rooms of your home, you can easily turn the system on and off using your phone, tablet, computer, and yes, even simple hardware controls. No Bluetooth pairing, no wires, just music. Before I go any further, the new Sonos Play:5 speaker will cost a hefty $500 when it’s available later this year. The Trueplay software will be available by launch, if not a little earlier. Now let’s get to the details. It’s been over five years since Sonos released its Play:5 speaker, and in the intervening time, it’s become something of an eyesore compared to the handsome minimal design of more recent products like the Playbar as well as its tiny $200 entry-level Play:1 speaker. The old Play:5 looks more 2005 iPod dock than modern audio system these days. On a recent Sonos-sponsored trip to the company’s California headquarters, executives described how they agonized over the refresh. 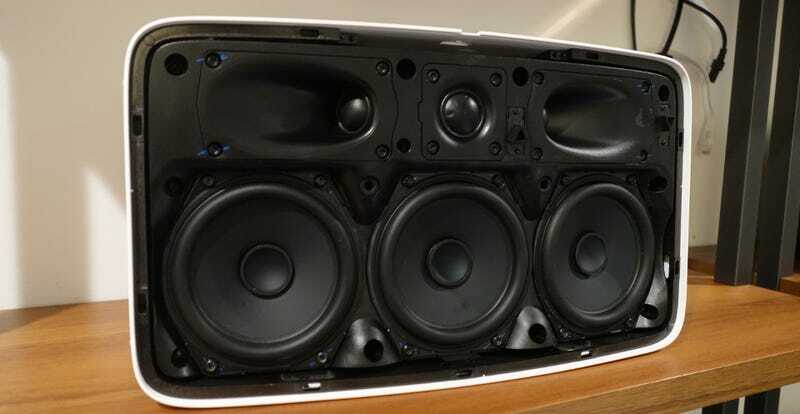 The company designs everything from the hardware’s enclosure to the six speaker drivers internally. Apparently, the only off-the-shelf parts are the screws. I can’t vouch for all the labor, though, the device is mighty good looking and sturdily built. (It weighs 14 damn pounds, by the way.) However, it sounded very good in Sonos’ controlled environment—and I have listened to a ton of speakers in my day. It even sounds good, with tonal clarity and powerful bass, compared to other Sonos kit, which I voluntarily use on a regular basis. Yes, I’m not just an audio gadget blogger, I’m a customer, too. Amongst the new features of interest on the Play:5 are a new control interface and a versatile design that works in both horizontal and vertical orientations. For the physical hardware controls on the Play:5, Sonos ditches buttons altogether and goes with a capacitive touch interface instead. Touch the speaker just above the Sonos label and it plays and pauses. Tap to the left or right and the volume goes up and down. Give the speaker a swipe across the three capacitive regions, and the track skips forward or back, depending which way you swipe. Smarter: The Play:5 is intelligently designed around the location of the label, so you don’t even have to look at the device for more than just a moment to know what you’re doing. This interface works in both vertical or horizontal positioning. An accelerometer inside communicates which way the speaker is oriented to the system, and adjusts the capacitive controls accordingly. As before, you can use a couple of the speakers to create stereo pairs, and curiously, the pairs sound a little different depending on whether the speaker pairs are vertically or horizontally oriented. If you’ve got the cash to shell out for a pair, you can explore a multitude of sounds with them. Maybe more exciting than the company’s new hardware, though, is its new Truplay software that makes Sonos speakers sound good no matter how you’ve got them configured in the various rooms of your home. At its core, Truplay is a configuration procedure for your speaker’s sound. It’s guided by the same user-friendly setup that’s driven the company’s interface design from the get-go. Simply place the speaker—any speaker from the company’s line—wherever you think it’s going to live in a room, and fire up the fine-tuning setup from the software’s settings. The software then guides you through a system for tuning each room in your system’s audio using your iPhone, iPad, or iPod Touch. The speaker(s) in a room play a laser-like test tone as you sweep the room with your device in areas where you’re likely to be listening to music. After listening for less than a minute, the system’s software takes what your device’s microphones heard, and uses the samples to configure exactly how to tune speakers so that the music sounds just right in that room. I heard the results in Sonos’ controlled conditions, and even tried it for myself. It’s remarkable how the tuning liberates you from the guesswork of placing speakers where you think they might sound good. Put ‘em where you’re going to put ‘em and Trueplay takes care of the rest. Tuning rooms for speaker configuration isn’t entirely new, mind you. Sonos’ real innovation here is building a system that people who aren’t audio nerds can easily use. The setup procedure, again, was labored over, and indeed, it is over-the-top user-friendly, to the point that more technically inclined people might feel like they’re being babied. Luckily, this isn’t for the technically inclined. It’s for humans. With the redesigned Play:5 and new Trueplay software, Sonos makes an ambitious move towards the next generation of satisfying audio, which is centered around the technology people actually use to listen to music today. And it’s moving forward just as some legacy audio companies—I listed them at the top of this post—are starting to catch up on the seamless wireless audio concept Sonos pioneered years ago. Sonos means to stay ahead, too. Buried within the new Play:5 hardware are ideas about the future. The speaker has currently inactive microphones built in, which theoretically could be used for configuration, or other unknown—nefarious? Haha!—functions in the future. Who knows! The company won’t say what they’re for or what’s to come. But the point here is that Sonos is staying a step ahead of the top audio brands when it actually began way, way behind. We’ll let you know how the speaker and software fare when we have a chance to review them soon. Note: Sonos flew me out to its headquarters in Santa Barbara to check out its new speaker and software. It was fun! I saw the company’s design process, drank local wine and beer, and talked to executives from Sonos about the company’s lofty guiding principles. Well not at the same time. We talked business and then drank. In that order. I think.